Photographs can also be accessed via UBC Library’s Open Collections portal. The University Archives has digitized its photographic holdings in order to make the images available to researchers on the World Wide Web. 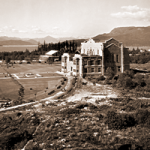 The over 40,000 images date from the founding of the University to the present day, and present a visual record of UBC’s growth and development, student life, and campus events over most of the past century. Researchers can search the entire database, or limit their search to individual collections or fonds, listed to the right by identifier number and collection title. Identifier numbers without hyperlinks indicate photo collections that have not yet been digitized. To order copies of photographs from our collections, users must complete and submit our Agreement on Use for Photographic Reproduction. By doing so, the patron indicates that he/she understands and agrees with the conditions outlined in the form. The University Archives will provide digital copies of prints, negatives, and slides from its holdings, subject to copyright and other restrictions. Images can be sent to patrons as e-mail attachments, or written to removable media. Users can add tags and comments to the descriptive information (metadata) for each image. User-defined tags can help make images more accessible. Comments are a means by which users can correct or add to information — for example, noting persons or events depicted in images that are not identified in the descriptions. The “UBC Historical Photograph collection” (1.1/) includes any images not acquired as part of a fonds, or of otherwise undetermined provenance. The “UBC Student Yearbook Photograph Collection” (51.1/) features images scanned from the published yearbooks, not the original photographs. McGill University College of B.C.